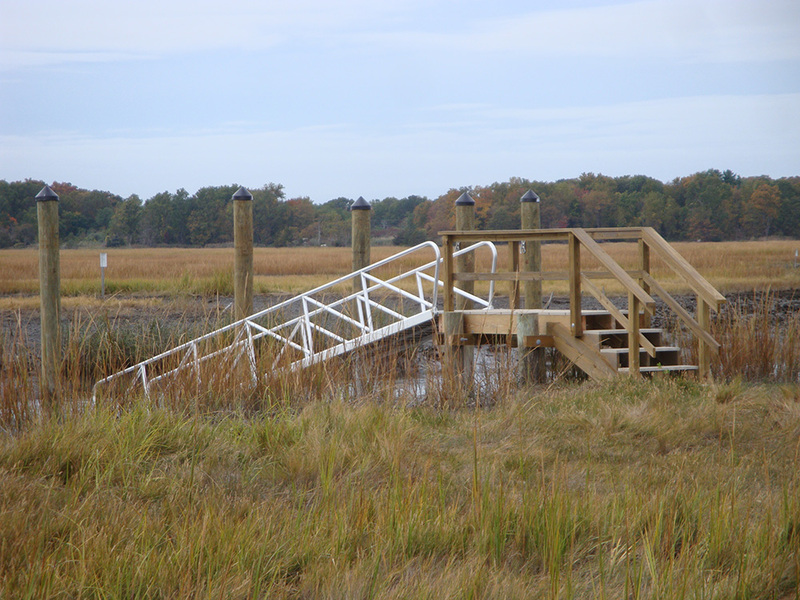 Sensitive to the surrounding salt marsh, this dock system was designed to allow the Spartina grass to flourish, as well as providing the homeowner access to the water. 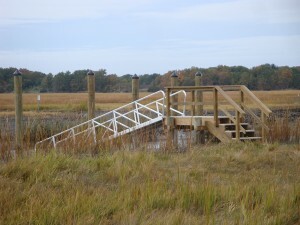 The permitted dock system includes a 140ft pier crossing salt marsh, while the outer dock at the river’s edge, includes a raised pier, aluminum ramp, and floating dock. The 140ft pier/walkway was constructed using IPE support pilings, heavy pressure treated timbers, and galvanized hardware, all to insure a long lasting structure. In addition a flow thru decking was required to allow sunlight to shine thru, for continued Spartina grass growth. Looking for a distinctive dock system to compliment your home, call Beebe Dock & Mooring Systems for that lasting impression? Sachem’s Head Yacht Club, Guilford CT.
Beebe Dock & Mooring Systems is recognized by yacht clubs and municipalities alike for the quality of our work, where safety and solid construction are the requirements. 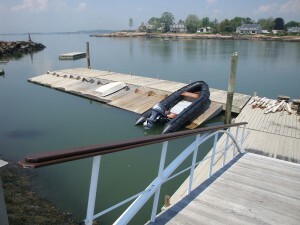 At the Sachem’s Head Yacht Club we have provided and maintain the floating docks and ramps for over 15 years. These docks serve as loading and unloading areas for club members, the launch’s landing site, and for the storage of many sailing dinghies. Throughout the summer months the club hosts a number of one-design regattas and the docks are considered one of their most important facilities, at this very active sailing club. Call us and let us show you how a Beebe Dock System is the best value for your club, or town’s needs. We have one of Beebe’s original floating docks, dating back some 25 years, and outside of the usual maintenance of cleaning and preserving the deck’s surface, the dock continues to serve our family.